I was able to sample the 4th and final instalment of the Big America burgers, this one called the 'Beverly Hills Burger' It was only sold through March 2012, as you might have noticed from my prior reviews of this years burgers, they've been pretty hit or miss. I enjoyed the Broadway Burger from last month, but I didn't like January's Las Vegas Burger nearly as much. 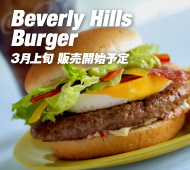 Before I reviewed any of them, I always thought The Beverly Hills Burger sounded the most tasty, as I am a huge fan of guacamole/avocado, its something I generally miss living in Korea, so the thought of it on a burger really interested me. This was also the most off-the-wall combination of toppings, having the standard beef, and mini-bun as the others, but also topped with Avacado, an Egg, deep fried onion bits and Caesar dressing in-place of mayo. Sadly. this was my least favourite of the series and I was very disappointed, but it wasn't for the reasons you'd expect. This Bevery Hills Burger still had the same basic problem as the others in the Big America Series, the beef patty was large, but like the others, it was bland and flavourless, rather than rehashing the same problems, check out my other reviews for more in-depth beef commentary (because everyone loves beef-commentary). On paper, avocado + egg is probably not the best sounding combination on a burger, and to be honest, even after eating the burger, I wouldn't be able to know, because both the avocado and the egg were so void of any flavour if I didn't see it on the burger, I probably wouldn't have known they were there. Granted, the egg did have some flavour once you hit the yolk, but as most of the egg was white, it didn't and anything but bulk to the burger. Even the Caesar dressing was weak (and my burger didn't really get much of it). The only special topping that had any flavour were the fried onion bits. They were hidden under the patty, with the sheer amount of food on top of them, I'm surprised I could actually taste them at all, but when you did, they were quite nice. The inclusion of the onion bits is the only reason this burger doesn't get a 1/5. More reviews to come from this trip. If this one is poorly written I apologise, its because I slept on the floor of Auckland Airport last night and I'm pretty tired, the free lounge coffee hasn't kicked in yet. My stomach is saddened by this.